I begin this story with a bar code, the kind that appeared on 1990’s Marvel newsstand comics… There is so much you really should know about newsstand comics versus direct edition comics in general [read this first if you’re not already in-the-know about the difference between the types], but for the purposes of this story all I want you to know right now is that in the below bar code that I’m about to show you, the numbers along the bottom are what you could think of as the “base code” for the monthly New Mutants title, and the numbers at the top right corner tell you the month. New Mutants #98 newsstand UPC code. Direct Edition copies of New Mutants #98 have this Captain America logo in place of the bar code. The circled portion, with the numbers “02” denote the month of February. If you find a copy of New Mutants #98 with the above code on the cover, the price box at the top left corner of the front cover of that copy will look like the picture at right — showing a $1.00 US price in bold, a smaller $1.25 CAN price underneath, then the issue number (98) below that, followed by the month (FEB). Below the month, notice the numbers “02207” (and now look back at the UPC code I showed you before, and note where 02207 appears along the bottom). That part will be consistent from month to month. UPC code for New Mutants #100, the final issue. So that’s the final New Mutants issue, where the code ending “04” would have therefore been the end! 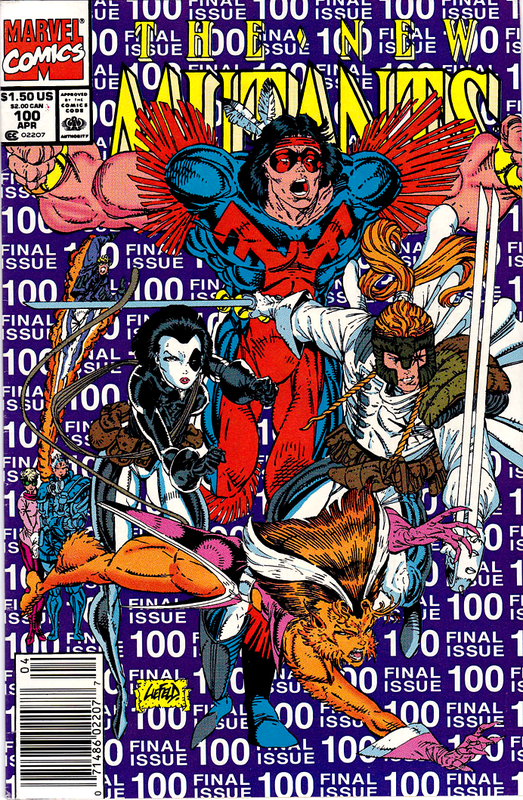 The X-Force would appear in this issue, and then begin with their own title with the smash-hit release of X-Force #1 in August. And it is at this part of the story that I have to throw a mystery your way. There was no issue #101 of New Mutants… that’s confirmed… So, how is it possible, that I hold in my hands a 1991 New Mutants comic with the following UPC code on it? That’s right readers, this code above is from a NEW MUTANTS comic, carrying the same newsstand code 02207 that we’ve become familiar with, it is from 1991, and the indicated month is 05… MAY. But… but… the New Mutants title had ended at #100 in April! It didn’t go to #101… WHAT is going on?!?! What have we found here? Read on, and by the end of this post, you’ll find out! At this point in the story I need to give some credit where credit is due. I did not make this discovery myself. Instead, this is one of the many times I’ve learned of an interesting comic I’d never encountered before, from a reader of this blog. As I’ve said before and I’ll say it again now: this is one of the huge benefits of blogging… I learn so much from readers! The reader who brought this to my attention is Bill Alexander, an advisor to the Overstreet Price Guide. So before I proceed further in the story — before I answer just what this mystery comic is and how it came to exist — a big thank-you to Bill who not only gave me the heads-up on this fascinating situation, not only shared invaluable research he’d already done, but actually sent me example comics in the mail so I could see what he’d seen, with my own eyes — and hold the comics in my own hands. As I continue this story of the “05 mystery comic” I need to briefly give you a taste of Marvel’s history as a newsstand experimenter through the decades — and I’ll start with the 1970’s just before direct edition comics came to exist — so that you’ll have the background information I feel you’ll need to fully appreciate the answer to the mystery when you hear it. A smaller batch of copies carrying a 35 cent price tag were distributed. The UPC codes (and everything else about the comic within) were identical. Before committing to a cover price increase, it turns out Marvel sometimes experimented, to test the market reaction to the higher price tag… by distributing smaller batches of comics carrying the higher price, to specific North American test markets, and seeing how well they sold by comparison to the regularly priced copies. A famous example you’ve probably heard of, are the 35 cent cover price copies of Star Wars #1-4 from 1977. As the lower distribution version, copies with the 35 cent cover price are quite rare as a percentage of the total copies out there. What percentage are we talking about? A great source of data that collectors are very fortunate to have in this day and age, is the CGC Census. CGC has kept track for us, of just how many copies they’ve graded, of the rare 35 cent type, versus the common type. Much like election polling and TV ratings that tell us relative popularity are done with a small sample of the total population of voters/viewers, CGC census data, while representing just a portion of the total copies out there (the portion that have been turned in for grading), can still tell us a heck of a lot about relative rarity. I just looked up the current census numbers for Star Wars issues #1-4, and as I type these words, a grand total of 8,375 copies across these four Star Wars comics have been graded by CGC to date. And out of that grand total, across these four issues, 388 variants appear, or 4.6% of the total. That’s a very small percentage indeed! No wonder the higher cover price variants are so much more valuable than their ordinary counterparts! By the way: outside of Whitman packs, “direct edition” comics didn’t exist yet at this point (that development would happen in 1979… and arguably represented one of Marvel’s most successful business “experiments” ever, as direct sales not only worked, they quickly grew to be the dominant form of comic book distribution). Marvel is a business… we must remember this, as collectors. And businesses, to remain successful, must continually experiment, they must try different ideas and make changes to the way things were done in the past, in order to adapt to what is thrown at them, and survive (and even to try and grow). In this way I think using the word “experiment” to describe their initial foray into direct edition comics is a great way to think about the business-level decision-making. Marvel learned as they went along, reacted to problems thrown at them, and in the case of direct edition comics they closed that loophole, first by putting a strike through the bar code on the cover of direct sold copies, and then eventually introducing the “Spider-Man Rectangle” (and other such logos) to direct-sold copies in place of the bar code. So that when we now proceed to look at the 1980’s, there are now two distinct sales channels for Marvel’s comics: direct edition sales, and newsstand sales. The currency exchange rate between the US and Canadian dollar had been relatively stable during the 1970’s, fluctuating around parity (sometimes a tad above, sometimes a tad below, but on average it was roughly one-for-one). But in the 1980’s the exchange rate began to jump substantially and didn’t reverse course, with the Canadian dollar becoming weaker against the US dollar. This meant that when Canadian revenues were exchanged back to US currency, they were a much smaller amount for Marvel — and the solution was to demand a higher price when the buyer was paying with Canadian currency. At the time this exchange rate movement became a problem for Marvel, the normal price tag on their comics was 60 cents. And they solved the currency exchange rate problem by adding an alternate 75 cent Canadian price in small type, to their direct edition copies… I’ve pointed that out with an arrow in the picture at the right (the comic shown is Amazing Spider-Man #238, the 1st Hobgoblin appearance). A rare 75 cent variant copy of Amazing Spider-Man #238 (1st Hobgoblin). But with their newsstand copies, instead of putting both prices on those too, Marvel essentially experimented… That “experiment” was to have two newsstand batches instead of one, a separate batch for each price — a 60 cent batch, and a 75 cent batch (thus giving birth to 75 cent variants as a category — and yes, there is a rare 75 cent variant version out there too for this Hobgoblin key as pictured at right [here are some other keys and interesting example comics from this variant window]). These different versions were all identical on the inside; so if you tore the front cover off of a 75 cent variant copy (don’t! ), or just snipped out the price box with scissors (don’t! ), and then sent it in to CGC, they’d grade it as a “regular” copy… because the all-important indicia page (and everything else about the comic within) would be identical to the other copies. What this 1980’s two-batch newsstand window means for the rarity percentage of the 75 cent cover price variant copies (or whatever the higher price tag was issue by issue) is quite interesting. Let’s briefly walk through it, in steps, to arrive at the likely percentage of total copies that were the variants. By the middle of the decade, Marvel reaches the 50:50 point of direct edition to newsstand sales. In the book Economics of Digital Comics by Todd Allen and Mark Waid, we learn that by the middle of the 1980’s, direct edition sales began to surpass newsstand sales. This 50/50 point is corroborated by information published by industry insider Chuck Rozanski, as well as supported by the writings of former Marvel editor-in-chief Jim Shooter, who described his 1986 struggles to save the ailing newsstand channel [see this slideshow for relevant quotes from these various sources]. This 50:50 point for direct-edition:newsstand falls right within the “window” of time in the 1980’s when Marvel was printing out two separate newsstand batches [the variant window eventually closed when Marvel “merged” these batches and began to put both US and Canadian prices on all newsstand copies, thereby returning to one newsstand batch]. So in thinking about the rarity of these middle-1980’s Marvel cover price variants as newsstand exclusives printed for Canadian newsstands, we’re starting with that 50/50 direct/newsstand point, taking that newsstand pie slice, and then thinking about how to split that newsstand pie slice up between Canada and the USA — which I will do next by considering the relative market size between the two countries… and the best way I know how to do that, is by population. The market for Marvel’s 1980’s newsstand comics was the USA plus Canada; by population size in 1985, Canada represented 9.8% of that market. When we look up the population of each country in 1985, we find that Canada was just 9.8% of the market for Marvel’s newsstand comic books, by population size. So, starting with the 50% newsstand pie slice, and then 9.8% of that being our higher priced variants, we’d arrive at an estimated 4.9% of the total copies being the higher cover price variants at that middle-1980’s 50:50 point [here’s a discussion of how it might have broken down year by year during the variant window]. Interestingly, CGC also tracks these variant comics separately on census, just like they do for our higher-cover-price 1970’s variants, but with different terminology this time: Instead of calling them “75 cent variant” akin to their terminology from the 1970’s, they instead dub these “Canadian Edition” on the Census — Canadian referring to the price on the cover, because CGC knows from looking at the prices listed on the corresponding direct edition version of any given comic, what the higher cover price would be for that issue for the batch of copies produced to serve the Canadian newsstand market. In the case of graphic novels, however, where the newsstand variable wasn’t in play and the purpose of the higher cover price isn’t crystal clear [i.e. no direct edition version to look at for reference to see both prices], CGC simply denotes the higher cover price variant by the price itself, for example the variants for Marvel Graphic Novel #4 (1st New Mutants appearance) are simply denoted “$5.95 Cover Price” by CGC. I recently studied the historical census data for the variant copies of Amazing Spider-Man #252 — data which, it turns out, goes back to 2001 in census snapshots. I found that back in 2001, the 75 cent variant copies of that issue were about 2% of the total CGC had graded at that point in time… and, fast-forward to 2016, the variants were also about 2% of the 2016 total going into year-end. And for these past 15+ years in between, the numbers have fluctuated a bit as new submissions of each type came in to CGC, but the total variant percentage has consistently been in that same ballpark ~2% percentage rarity neighborhood for the last decade and a half. This incredibly low variant percentage showing up on CGC’s census may be so much lower than the estimated original distribution percentage in part because of survivorship difference between newsstand and direct edition comics. The direct edition copies of any given comic should see a “magnified” survivorship percentage given that they were so well cared for by the collectors who took them home (and also well cared for by the comic shops that sold them who knew all too well that preservation of collectible condition was important — the owner of the comic shop I frequented as a kid had a special program for repeat customers like me where a mint condition bagged-and-boarded direct edition copy was set aside with your name on it, ensuring not a single collectible was missed). The typical newsstand comic, by contrast, needed a lot of luck to survive through to the present in any kind of decent shape worthy of sending in to CGC… The typical buyer on newsstands bought a comic to read it, not as a collectible — remember: the extreme rarity as a higher cover price variant wasn’t known to the original buyers who took them home. So instead of treating them as treasured collectibles (like they’d treat modern-day 1-in-whatever retailer incentive variants), generally speaking they were treated as an entertainment purchase, something to read, with no thought given to preserving collectible condition. “Serious collectors” knew the condition of the comics over on newsstands was terrible — so if they wanted to collect mint condition copies, they needed to make their purchases over in comic shops instead… where, whether they realized it or not, the direct edition type were sold. With this myopic focus on condition, collectors “self-sorted” the market for comic books into a mostly-collector-group taking home (and carefully preserving) direct edition comics, leaving a mostly-reader-group as the ones buying the newsstand copies — which was where the cover price variants were found — and then reading those already-low-distribution variants to death from there. With similar behavior — and without the Canadian market split between the two sales channels with two distinct versions — variant cover price copies of this graphic novel would therefore have reached that full Canadian pie slice of that graphic novel market (remember, with comic books, the market demand was satisfied by direct edition copies and variant newsstand copies — but in this case, the whole Canadian market got the same one version). Therefore, we might expect the variant percentage on census for Marvel Graphic Novel #4 to be driven purely by that Canadian:USA market size difference, in this particular case. And indeed, when we look at the census numbers for first print copies of Marvel Graphic Novel #4, we see the CGC census rarity for the $5.95 variant for that issue comes in at almost 9.8% on the nose — this near-pinpoint-precision tells me that using market size by population as a “guidepost” along the path to understanding rarity is the right way to think about the 1980’s category of cover price variant comics produced for Canada. Yes, I’m skipping the 1990’s for now but I’ll come back to them in a minute (they are the topic of this post after all). Newsstand sales at Marvel, over time, continued to decline dramatically relative to direct edition sales, and by 1999, Marvel made a conscious decision to “walk away” from the newsstand model. The impact this decision had on newsstand sales apparently further exacerbated their relative decline versus direct edition copies, with newsstand comics falling from 14% of sales in 1999, all the way down to 4.25% by May of 2003, as discussed in the book Economics of Digital Comics, by Todd Allen and Mark Waid, citing BPA audits. Marvel would eventually shut down newsstand sales altogether (in stages, with certain bookstore partners being the last to carry them), but not before the newsstand percentages fell to as low as 2% by 2005 and 1% by 2013 for Marvel, according to estimates by Chuck Rozanski. And it turns out that Marvel once again experimented with newsstand cover prices in this 2000’s era, with many known instances where newsstand comics carried a higher price tag than their direct edition counterparts, either for the US price, the Canadian price, or both. This higher price tag phenomenon includes an entire “publication window” where direct edition comics were regularly priced at $2.99 (US) each, and the same comics appeared on the newsstands with a $3.99 (US) price tag. (Eventually, apparently satisfied that the market would accept the $3.99 price tag, direct edition copies “caught up” to that $3.99 price point). Comics such as Amazing Spider-Man #569 (1st Anti-Venom, 10/2008), are among the keys that can be found out there with this $3.99 variant price (and once again CGC “breaks out” such variants, this time with the terminology “$3.99 Newsstand Edition” — here is a separate post that covers these in greater depth and gives some keys and other interesting examples out of this window). So here yet again we have comic book history rhyming, where there are key issues many collectors would like to own, and with the existence of cover price variant copies out there as a very low distribution percentage of total copies of each issue. Effectively these newsstand copies represent a “1-in-some-much-larger-number variant” version (where that much-larger-number grew bigger in size as newsstand sales dwindled in relation to direct edition sales over the course of time), but one that wasn’t actually known to be rare by the market that purchased them at the time they were originally sold. Imagine, if you would, a comic shop owner sitting behind the counter enjoying a slice of pizza. The bell on the front door jingles and it is a delivery: they have gotten a new 1-in-100 variant through their door. The comic shop owner casually wipes their greasy hands on their pants, signs for the delivery, then proceeds to open the comic up, read it with their still-greasy fingers, and then toss it haphazardly in a pile. The scenario I just described would be crazy, right? That would be like setting fire to a pile of cash. Would never happen! Yet, what I just described, that’s effectively what late modern Marvel newsstand comics are: low distribution variants that were treated terribly by not just the staff but also most of their buyers, buyers who were unaware they had purchased anything special or rare by print run comparison… Thus leaving precious few highest-grade-survivors out there among these already-ludicrously-rare cover price variants. And now back to our “mystery comic”… and the 1990s. The comic book industry was booming as we entered the 1990’s. This boom period would eventually go bust, with Marvel famously going through Chapter 11 bankruptcy reorganization (they filed for bankruptcy protection at the end of 1996 [chapter 11 is a “reorganization” where the company doesn’t disappear, it survives on, but debts are restructured]). 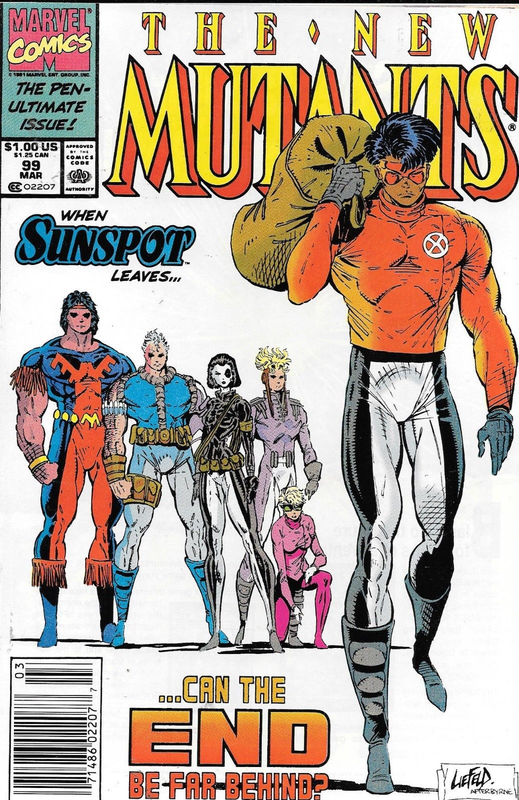 A “direct edition” copy of New Mutants #98. As you can see, there are three prices shown on direct edition copies: $1.00 US, $1.25 CAN, and then at the very bottom, UK 60p (for copies sold in the United Kingdom). That covers all the biggest English-speaking markets for Marvel, right? Or does it? Any other big countries out there with English as the primary language? What about the “Land Down Under”? 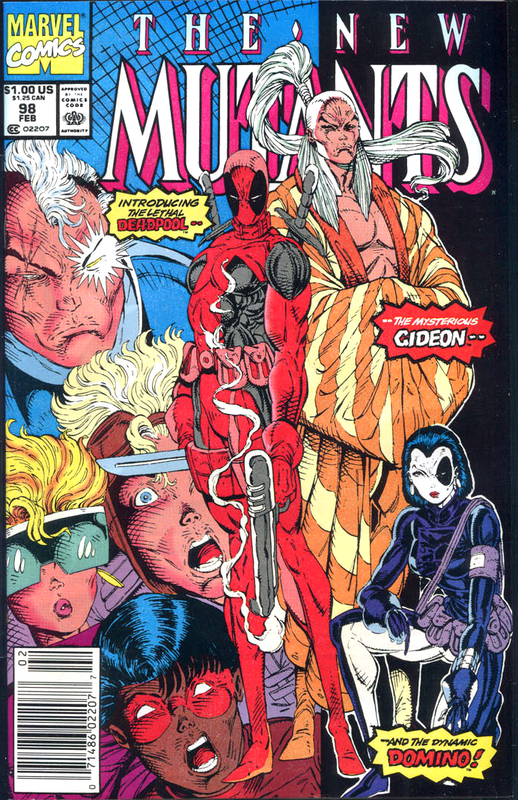 New Mutants #98 with “05” newsstand code… May month on the cover… and $1.50 AUS cover price. Under the UPC code at the bottom, $1.50 AUS is repeated. Marvel, that continuous newsstand experimenter, produced the above-pictured copies of New Mutants #98, continuing the same New Mutants UPC code used on newsstands here in the USA (and Canada) but with “05” at the top right of the code (it is possible these copies would be sitting in a container on a slow boat to Australia for quite some time, and the May month would ensure they didn’t seem out of date when they eventually hit the stands there)… And of course, it was priced for Australia, at $1.50. And here’s the craziest part… If I tore off the front cover of one of these and submitted the book to CGC for grading, guess what they’d find in the indicia? It is, in fact, identical to all the other copies of New Mutants #98, just like we saw with the variants of earlier decades. Everything on the inside — from the February 1991 publication month, to the “Printed in the USA” line, literally everything inside the cover — is identical to other New Mutants #98 copies! Despite the “05” code and “May” on the cover, the indicia page states February. The indicia (and comic within) is fully identical to all the other copies of New Mutants #98, down to the Printed in the USA line. This comic’s birthplace: The United States of America. The existence of these newsstand variants is extremely surprising, because there was no “cue” in the direct edition copies to go looking for their existence… i.e. there is no Australian alternate price shown for any direct editions. So why would anybody think to go looking for a newsstand edition priced for Australia? So: how might we begin to think about the likely rarity percentage of these variant copies? Let’s see what we get when we do the same kind of breakdown we did earlier for the 1980’s variants, i.e. we’ll start with a pie divided into two slices between direct edition and newsstand (this time based on 1990’s sales statistics), and then we’ll divide the newsstand pie slice by market size (by looking up the 1990’s population of each country that got newsstand copies). Estimated 1990 split for Marvel: 15% newsstand to 85% direct edition. For 1990, there is an estimate from Chuck Rozanski at 15% newsstand to 85% direct edition; and the book I mentioned earlier, Economics of Digital Comics by Todd Allen and Mark Waid, mentions a 1999 audit showing Marvel’s newsstand sales for the first half of that year at 14%. Since these two percentage figures from two different sources are pretty close both in year and in value, let’s proceed to see what happens when we take an assumption of a 15% newsstand pie slice, and then divide that by market size (by population) among the countries that got newsstand copies. A 1990 population comparison for the USA, Canada, and Australia, shows Australia at 5.8%. According to the US Census Bureau and World Bank numbers, entering the 1990’s we had a population here in the USA of 249.6 million people, Canada had a population of 27.79 million, and Australia came in at 17.07 million. As we saw in an earlier picture, Marvel’s North American newsstand batch had both US and Canadian prices listed, in other words the newsstand copies found on the stands in the United States and Canada were the same in this time period (that 1980’s dual-batch-window had long since closed). So in dividing the newsstand pie slice, we’re really just dividing it into two types: the North American type, and the Australian type. Australia’s population represented 5.8% of the combined market size across the total of these three countries that got newsstand copies. So if we now take 5.8% of the 15%-newsstand-pie-slice, that gets us to: 0.87% (zero point eight seven percent) of total copies being these AUS variants. (Excuse me a moment while I pop my eyes back into my head). It is very difficult to know, as a probable newsstand experiment, and as one conducted overseas, whether the population size would have followed through in this way to the number of copies — after all, with any experiment, the one conducting the experiment calls the shots just as much as the market size does, and in this case the experimenter had an interesting problem to consider: what to do with any copies that didn’t sell through on the stands. Here in North America these unsold newsstand copies would be known as newsstand returns… with the infrastructure in place to recycle/pulp and/or sell the returns into a secondary market (like these example Whitman packs containing 75¢ copies inside the plastic and sold in Toys R Us) as warranted by market demand. But the idea of Marvel pulping unsold returns is a very different question across the world in Australia. Given this unknown, how might we think about the possibilities? Here in North America, it was common to over-produce (not knowing how many would ultimately sell through, it was better to err on the side of over-producing, than under-producing, knowing the excess could simply be recycled forward). If Marvel was just doing a “test” with these Australian copies, and the overseas aspect made handling of returns tricky, might they have erred on the side of under-producing so as to minimize unsold copies? Or, might Marvel have still erred on the side of over-production with the idea to later liquidate any unsold newsstand copies locally there, for the best bulk price they could get? Either of these scenarios makes sense to me logically as possibilities, but I have no way to know what actually occurred (or if it was something in the middle). So with the caveat that we can’t really know for sure how well we’ve done coming to these numbers, and this is an exercise in estimation, I’m going to take the 0.87% figure we arrived at earlier and turn it into a range to allow for the possibility that Marvel may have over-produced the Australian newsstand copies, and that the unsold copies still made it out to the Australian market via some other sales channel rather than being destroyed. So let’s triple our number on the high side to give plenty of leeway for some of the unknowns, and use “0.87% to 2.61%” as a range for the rarity percentage, and then let’s apply that against the total count of copies of New Mutants #98, to see what kind of total numbers we might be talking about for the $1.50 AUS variants. According to this source, New Mutants #98 had a print run of 275,000 copies. Apply our estimated variant percentage range just discussed, and we’d be in the neighborhood of 2,400 to 7,200 copies with the variant $1.50 AUS cover price. [By the way, Bill Alexander shared with me that he independently arrived at his own estimate for this issue, of 3,225 copies]. And this is before considering buyer behavior — that notorious-newsstand-destruction-rate variable would be in play with these. Recall that when we looked at the rarity percentage for Marvel Graphic Novel #4 variants (where the newsstand variable wasn’t in play), it followed the predicted distribution rarity almost on the nose, but meanwhile when we looked at 1980’s newsstand variant comic books which had that newsstand variable in play, the percentage we observe on census (like Amazing Spider-Man #252 — at a mere 2% Canadian Edition) is much lower than what we might have expected if our expectation had been based on the likely percentage sold at the time of initial distribution. I’m a big fan of CGC, as so many of us are — and a logical next question that might occur to you at this point is: How does CGC treat these $1.50 AUS copies? I certainly had that thought myself upon learning about the existence of these variants, and for one thing I was very curious to see how CGC cataloged the comic as far as the publication month — would they use the “05” (May) month shown on the UPC code on the front cover? Or would they use the February month shown inside the comic on the indicia page? I suppose one way to think about this question, if you were the one deciding how to catalog the New Mutants #98 variant, would be in the identification of a coverless or damaged-cover copy. Tear off the cover — or remove key pieces of it with scissors (don’t!) — and if you handed me one of these in that altered state, I’d most certainly identify it by the indicia page, and I’d therefore conclude it was a plain old “regular” copy of New Mutants #98, published in February of 1991… just like it says there in the indicia. CGC opted to catalog the variant under 5/91 (what appears on the cover) as the issue date, rather than 2/91 as appears in the indicia page. I was curious to see, clicking through on that May entry, whether the “key comments” note would carry any indication that the indicia for this comic shows February as the publication month. And I found there was not such a note presently there (see next picture below — the note does carry the 1st appearance credits, but no note about the conflicting indicia date or the USA birthplace). I feel a special label note would definitely be appropriate given that the indicia information inside the comic is in conflict with what is shown on the cover (I will suggest an improvement to the “key comments” when I submit my own copy). Present CGC census data, as of this writing, for the $1.50 cover price variant. As you can see, CGC denotes these as “Australian Edition” but the key comments note does not make mention of the 2/91 publication date shown in the indicia. CBCS has a foreign expert named Tim Bildhauser. If you want your international editions labeled correctly, use their service. CGC has failed to listen to any of our pleas about correctly labeling the actual publishers or editions. It seems arbitrary what info you will receive on your foreign edition label. I don’t think they care much for these books. Tim painstakingly takes the time to do the proper research. Wow! the New Mutants #98 U.S published first print edition type 1a Marvel Australian $1.50 cover price variant was published at the exact same time as the U.S. $1.00 cover price edition….. amazing!. Based on how tiny you pointed out the print run to be on the type 1a Australian $1.50 cover price edition, if the hobby catches on to the books true rarity then the book may well end up in the Overstreet Price Guide top ten Copper Age books that they list. Since I became aware of these variants, I’ve witnessed just one eBay sale of a New Mutants #98 copy that was identified as the variant (I can’t find a single other copy searching today on the phrase “New Mutants 98 Australian” nor “New Mutants 98 AUS” nor “New Mutants 98 variant” either in the sold or the active listings). The one sale was this one below, described as VG/FN, and I can tell from the sold listings section sorted by order of highest to lowest sale price, that this variant copy fetched a higher sale price than the three books pictured below it in the following screenshot, which are: (1) a CBCS 9.0 copy signed by Rob Liefeld; (2) a CBCS 9.4 Direct Edition copy; (3) a CGC 9.4 Direct Edition copy. A dramatic price difference for sure, when a raw VG/FN AUS variant copy beats out these slabbed NM direct edition comps… Which prompts one to wonder: what would a NM variant have sold for? Pondering that question, and extrapolating this VG/FN sale up to higher grade, one could definitely picture the value in high grade being competitive to the Overstreet top ten in the Copper age. And, a situation definitely reminiscent of the 35 cent price variant market value difference for bronze age mega-keys — I believe Star Wars #1 35 cent copies and Iron Fist #14 35 cent copies consistently/regularly appear in the Bronze Age top ten. And what arguably keeps bringing those 35 cent variants onto the list is the combination of (1) lower distribution than regular copies = small supply of variants; (2) high collector interest in the key issue = large demand. At the start of the year I put together a list of the most highly submitted key copper age comics, and found that New Mutants #98 was number two on the list (behind ASM #300), with 11,846 submissions to CGC at year-end. I just checked the most recent tally and it is up to 12,472 as of today. Pretty incredible to juxtapose this census count of “regular” copies, to the likely total number of AUS variants out there. I think of the CGC count for a given issue as an interesting demand metric: collectors demand this issue so highly that the demand was out there for over twelve thousand CGC graded copies. Imagine if every one of the owners of those 12K+ copies became educated about the AUS variants… can you imagine the demand for them?? And then just like we know 35 cent variants had lower distribution than “regular” copies on account of being restricted to only specific chosen population centers, we similarly know that AUS variants had lower distribution on account of being restricted to newsstands in Australia, a small market by population size. So that same dynamic of a small supply of variants, combined with high collector interest in the key issue, could most certainly send the New Mutants #98 variant to that Overstreet top ten of the Copper Age in the future (hmm… but I guess ahead of that, Overstreet would first have to recognize they exist and break them out in the guide… and they haven’t even broken out the 1980’s Canadian price variants yet…). Just imagine the bidding frenzy if the owners of those 12K+ CGC graded “regular” copies of the issue came to understand the AUS variants and their rarity, and were then fighting to win one of the five variant copies that CGC has graded to date? Hi Jimmy, thanks for reading and commenting! It is interesting how different collectors “draw a line” for what they will collect, in different ways: for some, if it is a comic of any type, then it is fair game for their collection. For others, they will draw different lines. One line I’ve seen collectors say they won’t cross is to collect a comic that isn’t in English… any foreign language on there and it is not welcome in their collection, that’s their line and they won’t collect it (no Spanish, Polish, Swedish, etc.). I’ve also heard collectors say they avoid Pence variants for that “similar” reason (i.e. they think of the denomination of the currency as “foreign language”). For others, if the comic was a reprint published on foreign soil, that’s where they draw their personal line, and they won’t collect it (even if in English). But even for those particular Marvel issues printed in Canada by Ronald’s, they could be considered published in the USA because Marvel as the publisher was based in the USA. So I think it makes a great deal of sense for collectors to have a “field of view” for their collecting world that is at least as wide as “published in the USA” (but of course every collector is different and in my opinion should basically draw their own lines at collecting what makes them happy… there’s no reason to collect something that wouldn’t make you happy!). And if a collector draws their line at “published in the USA” then the Marvel AUS price variants and the Canadian price variants from Marvel are actually both inside of that line and therefore both fair game… because both types were “born here” in the USA. But, after being manufactured, the AUS variants reached their target market several months later than the North American version hit the stands (the AUS variants likely spending a lot of time traveling by boat)… and the AUS variants do carry a later cover month than the North American version despite their identical-to-the-rest interiors… while the Canadian price variants by contrast were already part of the normal North American distribution infrastructure and carry identical cover month to the US version. Another key difference between the Canadian price variants and the AUS variants is the “scissors test” — if you snip out just the price of a Canadian price variant of the 80’s with scissors, I could no longer tell the altered copy apart from the regular newsstand copies if you asked me… But with the AUS variants there is additional snipping required beyond the price because of the differing UPC code and cover month. …. They will be struck in the other direction and will find them to cross their own personal line of what they consider “too foreign” and therefore decide the AUS variants don’t have a place in their collection. The “Australian Edition” labeling by CGC definitely “pulls” in the direction of a foreign/non-USA feel… but then again so does “Canadian Edition” have a non-USA feel on the labels of our Canadian Price Variants, a labeling convention which some collectors will vehemently argue inappropriately conflates them with the “real” Canadian Edition comics of the 1950’s era. Back then around the 1940’s/50’s, as I understand the history, because of the advertisements on comic books, they were restricted… there wasn’t a way for US publishers to sell their same comics in Canada back then. So to get around this restriction they sent up the actual printing plates and Canadian publishers then created a local batch of copies that were printed with the words “Canadian Edition” on the cover or the indicia page in order to show that they were reprints of the American comics but made locally in Canada at a later date (and also switching some or all of the advertisements). CGC denotes such 1950’s books that were foreign printings from Canada as “Canadian Edition” on the census — which although from a different era than our 1980’s variants, might be seen as conflating an actual foreign edition with the 1980’s Canadian price variants which instead were true first print US-published Type 1A variants (by Jon McClure’s definition), and therefore a US-published edition. Similarly AUS price variants were a Type 1A US-published edition… produced to serve the Australian market. And similarly, as I learned from a comic shop owner in Australia, there exist “actual Australian Edition” comics from local Australian printers (as he described them, classic 60’s, 70’s, and 80’s issues printed locally in black and white). But these actual foreign-produced later-reprint Australian Editions (and Canadian Editions, German, Swedish, what have you), are a much different situation than actual Marvel-published comics that were produced on the same equipment as their regular US counterparts, at the same time, with identical interiors — as the AUS price variants (and Canadian price variants) are, falling into the Type 1A classification. So another line you could choose to draw around “foreign” books is a line around Type 1A, as true variants of the first printing from the original publication date and the original publisher. It sounds like your own reaction and collecting inclination is to draw a line around the market where a US-published comic was sold… and anything outside of North America is your line. Whatever comics you choose to accept into your own collection, I do not judge you — my philosophy is that for each person, collecting comics should be something that makes you happy, and therefore, very simply, don’t collect it if it doesn’t make you happy. In my opinion you don’t even need a reason beyond that simple “happiness test” to call the shots of what’s in and what’s out for you. But when considering drawing lines by the point of sale being inside or outside of North America, something to think about is how such a restriction would prevent you from buying, say, a variant produced for and sold exclusively at the London Comic Con, as a hypothetical. Restricting yourself by rules can get tricky! I say, if you like something, let yourself break whatever rule might have been holding you back. As for how much to pay versus a regular edition, that too is an individual question, but I can tell you my own individual answer in a hypothetical: I’d really like to upgrade my New Mutants #98 AUS variant to a CGC 9.8 copy. Alas, none exist right now, but suppose hypothetically one came into existence and hit eBay at auction. I could never predict where it would sell, but, I can tell you individually how I personally would bid: I’d bid much higher than the regular edition. Who I’d have to outbid to win it would then write the story of whether I’d be the one to take it home, and at what price. If the entire rest of the marketplace decided to “bid 9.8 prices” but no more, then, I’d win at a slight margin to the regular 9.8 price… because I’d simply have to outbid the normal 9.8 price. But if there were any other bidders who saw the value like I see it, then that’s where prices would go up at the margin. And I have a feeling that these AUS price variants are going to see their fair share of discussion in future publications serving the hobby, driving more collectors to become aware of them and desire them. So if I were to take home that hypothetical 9.8 at just-slightly-more-than-regular-price at auction, I’d have a super-wide grin on my face! I just received my CGC SS(Liefeld) 9.0 and it was not labeled …so I guess I need to get it re-slabbed at some point. Still….second highest graded. Wow, that’s awesome to own a Liefeld-signed Signature Series copy of the variant, especially in such high grade! It is a little surprising that they’d “miss” an AUS variant at CGC given the different cover month in addition to the different cover price but the fact that they did miss it with your copy really goes to show how nearly-identical they are to the “regular” copies. When a variant is close enough to the rest of the print run that it can pass for a regular copy, that’s precisely how these interesting situations of undiscovered variants arise in the first place! Hi everyone, a reader contacted me to report that there has been a sale of a CGC-graded New Mutants #98 AUS variant. I just found it online in the sold section of eBay and wanted to share the screen-capture — I searched the eBay sold listings section for “New Mutants 98 CGC -SS” (the -SS part is meant to try and exclude Signature Series copies where the value will be derived in part by the signatures themselves), and sorted from highest to lowest sale. As you can see in the below screenshot of the top 10 recent sales, we have a “perfect 1-2-3” ordering by rarity here, with the #1 highest sale being the AUS variant newsstand copy, the #2 highest sale being a North American newsstand copy in 9.8, and #3-and-below all being the prevalent direct edition. If this perfect 1-2-3 ordering doesn’t reflect a growing awareness in the hobby of both newsstand desirability generally and Type 1A variants specifically, I don’t know what does! So a CGC 9.0 VF/NM price variant garnered an 86% premium over the average of the last three NM/MT direct edition sales! And yet if you ask me, the winner of that CGC 9.0 copy got a bargain relative to the underlying rarity. But I recently discovered that one of those three 9.6 copies is just a labeling blunder, not a real variant (here are pictures and a discussion of that labeling blunder). So my guess is that you will own the single highest-grade example New Mutants #98 price variant for quite some time! So going forward one of the big two grading companies will be recognizing our AUS price variants with price variant labeling!